I’ve been researching gut health for years. Ever since realizing my daughter had food allergies, eczema, and other health concerns as a baby. We were able to mostly heal her gut, and I’ve shared our journey with that. But, even after, my research didn’t stop (especially after our experience with mold). There are endless gut healing diets, supplements, and protocols. Everyone has a different idea about which foods or supplements are good and bad, and why. Some of the advice is conflicting. A lot of it feels out of reach for someone who is just getting into gut healing. Many protocols also don’t address the gut in a way that really makes sense (you’ll see later!). Most of the diets are extremely strict with lots of steps and stages. Many of the supplements are expensive and can come with some serious side effects. “Die off” is a big topic. After 10 years of reading and playing around, this is what I’ve come up with. It should be said, I’m not a doctor. If you want the opinion of an MD, go see one. Just know that most are unaware of the research being done into gut health and and they may not be all that helpful. But, I’m not an MD, so. Proceed if you want. A lot of the people talking about gut health, frankly…don’t know what they’re saying. But I’m not targeting them — all the research is very preliminary, all people are different, and none of us really know for sure. Many have found protocols that work for them and possibly others; but nothing is universal. It’s certainly great that those who have had success are speaking up and sharing with others. Keep that in mind as you read through my research and experience. I’ll be sharing studies to back up what I say, but I’m interpreting it all through my own lens. Your experience or needs may vary. For the kids, it wasn’t that big a deal to heal from. They were young, they are resilient with good diet and lots of outdoor play. For me, it was harder. Not only as an adult, but I had two pregnancies since we left that house, which takes a lot out of me, and disrupts the healing process. Not that I would trade my babies! When we first walked away from the mold, I did what everyone said we should do. Cut out all grains and sugars and start doing lots of probiotics. It didn’t work. Any form of probiotics made my anxiety worse for years, and my gut didn’t get better. There was very much something missing from these protocols, in terms of herbs and foods. But I didn’t yet know what. After nearly 5 years of working on this, and many, many hours of reading studies and asking questions, I have stumbled on to things that have actually worked. My gut is better. I can handle probiotics again. I have more energy, I sleep better, my skin has mostly cleared up. There’s work to do, yet, but at least I know where to go now. In this post, I tell you all I’ve learned. That’s not good news, because most of America lives on all of these things. Fast food, soda, regular ol’ laundry detergent, multiple prescriptions, plain tap water…. It’s all wreaking havoc on our guts. Some people like to harp on just one small part of this. For example, that it’s all about the vaccines. (It’s not, but they do play a role.) Or that we need to focus primarily on mental health issues (they are important, but only a small part of the picture). The good news is, we don’t need to play whack-a-mole and try to look at all the things harming us and all the problems they’re causing separately. This is a universal issue. Our modern life is, in many ways, simply bad for us. But we can do something about it. These are some of the most common symptoms/problems. 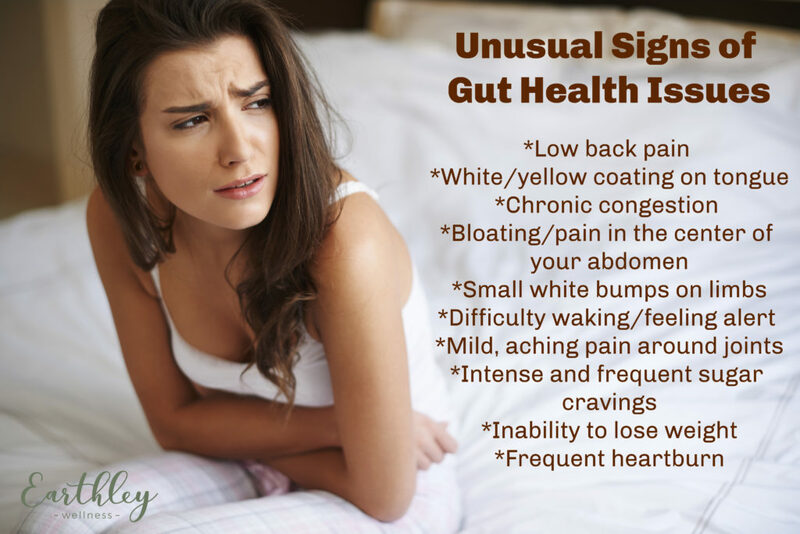 And these are also non-specific symptoms — they could be related to any number of “diseases.” But that doesn’t matter for the purposes of gut health here. You may also experience some subtle symptoms that you didn’t even know could be related to gut health. If you’ve seen any of these, they may also be a sign that you need some gut healing! The body gives us many clues — if we know where to look and how to interpret! When something is going wrong in the body, inflammation is the result. Now, sometimes this is a good thing. If you cut your finger, your body will rush “defenses” to the injury, create inflammation, and heal itself. Then the inflammation subsides. Inflammation is very, very useful in the short term. But when inflammation becomes chronic, then it’s a problem. Long-term inflammation means there is ongoing damage to the body that it can’t heal. Often, health erodes over time. This is where we see high cholesterol, high blood pressure, overall weakness, leaky gut, and more. They are all signs of chronic inflammation in the body. We need to get rid of the inflammation — but more importantly, to heal anything, we have to get rid of whatever is causing the inflammation. Before we talk protocol…we need to understand something important. Lots of people talk about the gut being the ‘root’ of everything. Others will claim it’s the spleen, or the liver, or…. Listen. No. There typically is no one ‘root.’ The body is a whole. A unit. What affects one area, affects the whole thing. There is no way for something to affect just one organ and not others. We’re dealing with a holistic view here. Second, this is not going to be a quick diet or short-term fix, and then you go back to your old ways. The body is built by what happens within it long-term (diet, exercise, etc.). Short-term fixes may help somewhat, in the short-term. But if you want long-term health, then you have to change your habits. Too many protocols out there look at the body as a sum of parts and target only certain areas. And too many have specific stages and rules and allow you to ‘relax’ after awhile and go off the diet (and back to the things that caused issues in the first place). These will not work properly. This approach is going to be different. What I found when I first started trying to heal my gut was, I could not go on a super strict diet and protocol immediately. It was too much for my body to handle. There are layers of damage and it takes the body awhile to deal with each thing. Try to do it all at once, and it just doesn’t go well. That’s why, as you do this, pay close attention to what makes you feel good and what makes you feel weak or bad. If something makes you worse, then either figure out the underlying need and address that, or stop doing it. For example, if you cut out sugar and feel worse, it’s not that your body ‘needs’ refined sugar. It may be that you need more food in general, or magnesium to balance blood sugar, or something like cinnamon to reduce inflammation and help balance blood sugar. Look for how to solve the problem. This feeling should be temporary (and that’s how you know it’s ultimately good — you should feel better over time). But, if you go completely grain-free and feel weak and sick (this happened to me at first, a few years ago), your body may not be ready for that level. Eat unrefined, whole grains again and plenty of fruit. It doesn’t matter how many people extol the virtues of the grain-free or low-carb diet and how “everyone” needs to do it; if you feel terrible and non-functional, don’t do it. Never push through a protocol that’s making you worse over time. It’s okay to feel a little weird or not great for a few days, and then better. That’s pretty normal. Feeling worse and worse is not normal and a key sign that it’s not working for you. Or, feeling initially better and then starting to feel worse — that’s a bad sign. Listen to your body. The first goal has to be to reduce inflammation. Something environmental (whether food, air, water, etc.) is causing the inflammation. We have to get rid of the sources of inflammation, and then start a food and herbal anti-inflammatory protocol. It’s okay if this process takes weeks or months to accomplish. Replace things as you run out or simply stop buying certain things. Make a goal to do a little better every single week — but keep at it. If you’re at the store and you’re tired and you want to buy more of something you know is not healthy for you, don’t give in. When it comes to diet, all processed foods are out. Nothing that is premade unless it’s single-ingredient or small number of ingredients. (Frozen organic mangoes = yes, boxed cookies = no.) Even “organic” and “natural” processed foods have to be out, if they have sugar, white flour, vegetable oils, etc. No veggie chips, no rice cakes, no cookies. Absolutely no preservatives or additives of any kind. Also, no white flour and minimal other grains — many will eventually need to go no grain. This is not so much because grains harm the gut directly (although for some people, they can). Whole grains contain phytic acid, which blocks nutrient absorption. Right now, you need all the nutrients you can get. Read more about why phytic acid is such an issue in gut healing diets. Absolutely no sugar. Not white, brown, sucanat, coconut, nothing. Some people can tolerate small amounts of maple syrup or raw honey, but these should be kept to a minimum. We’re not trying to starve the yeast here; we’re trying to reduce inflammation. High blood sugar levels and low-nutrient foods are hard on the liver and pancreas and gut — so we need to stay away from this. All other “real food” is permitted, unless you have a particular reaction to something. Some may not tolerate foods like soy, dairy, beans, eggs, nuts, seeds, nightshades (tomatoes, peppers, white potatoes, eggplants) or high-histamine foods (meats, fermented foods, certain fruits). Keep a food diary and watch closely for symptoms after eating, and eliminate foods that make you not feel well. Hopefully, as far as ‘real foods’ go, removal should be temporary. Personally, I eliminate kidney-shaped beans, because these don’t work for me (notice a flare in symptoms), but I do eat garbanzo beans and peas. I also eventually eliminated chocolate, soy, carrots, potatoes, wheat, and a few others. So don’t eliminate any large groups of foods; see how you feel with each. Anything that is causing inflammation for you, needs to go. If you can filter your tap water, great. (Read more on water filtration and what system to choose.) In your home, switch to natural shampoo, conditioner, toothpaste, deodorant, laundry detergent, skin care, makeup, cleaning products, etc. Get rid of scented candles or oil-based scents. Add living plants and open the windows more often! Essential oils in a diffuser are also a nice touch to clean the air and make it smell nice (lemon is one of the best options). This is not going to be an overnight thing. This is going to take awhile. And that’s okay. Just keep doing better, week after week. Now that you have removed things that are pro-inflammatory, it’s time to start with things that are specifically anti-inflammatory to help your gut. Notice that fermented foods are not on this list. They are a bandage, at best, at this early stage. And, they are high in histamine — which is a problem for those who are already experiencing histamine intolerance. (Histamine levels are normally high in the gut, but inflammation increases this. Chronic stress and low magnesium also play an important role here.) Unlike most protocols, we’re going to wait on fermented foods. It took me probably 2 years to tolerate them, and I had to start slowly. It would not have taken as long if I had known then what I know now. So! What do you actually need to do? What should you be eating and how should you be supplementing? Here is my actual plan. Keep in mind…you may need to start slowly here, too. Choose organic foods and herbs if you can afford to. Wild crafted are good too. I have a buying guide at the bottom with my recommended brands. Blend all of this until smooth. Drink each day. If you prefer, chaga mushroom and Oregon grape root can be taken in a capsule instead of mixed into the smoothie. Yes, this has to be grapefruit. Grapefruit has been shown to increase glutathione production (source), reduce inflammation, protect the kidneys, protect the liver, and more. Grapefruit also functions as a digestive bitter, stimulating digestive juices and making it easier to digest food throughout the day. Grapefruit can interact with certain medications, though, so if you are still taking those, you may have to skip this at first. Use plain water as a base in that case. You can substitute mango for other fruits, like tart or sweet cherry, any berries, pineapple, etc. Each has its own benefits. I like the sweetness of mango blended with the bitter/tart grapefruit. But sweet cherry and strawberry with grapefruit is also good. Cayenne pepper is a potent antioxidant and anti-inflammatory. (source) If you cannot tolerate nightshades, cinnamon or turmeric can be subbed in here. If you choose capsules of chaga or Oregon grape root, start with 1 capsule of each, and increase by 1 every 4 – 5 days until you are taking 5 of each. If you have trouble tolerating so much at once, start with the Oregon grape root first, and begin the chaga mushroom a week or two later. Boil this mixture for about 10 – 15 minutes, then let it sit for another 10 – 15 minutes until it is deep yellow in color. Strain, and add a small amount of raw honey (if desired and tolerated) and drink. If you’re not a salad fan, any other fruit or veggie-heavy meal is fine. Make chicken vegetable soup, or grill mushrooms and onions and peppers and top with balsamic glaze. Taco salads are also fun, with fresh avocado slices, salsa, cheese (if tolerated), and meat or beans. Snack, again! Choose some fruits or veggies with protein (carrots and hummus, or apples and almond butter, etc.). Repeat digestive bitters before the meal. Again, stick to lots of fruits and veggies with some protein. It can be as simple as sliced strawberries and celery with grilled meat. You could choose a blended soup, or a smoothie. I’m a fan of skillets — one of my favorites is chicken with peppers, onions, and mushrooms (topped with a little provolone cheese sometimes). After dinner, golden milk! This is a blend of coconut milk and turmeric. Coconut milk has anti-inflammatory, anti-bacterial, and gut-protecting properties. (source) Turmeric basically helps to reduce inflammation and heal the gut also. (source) Blend 1/2 tsp. of turmeric powder into 8 oz. milk and warm it slightly. A small spoonful of raw honey will make this taste nice. There are a few key supplements that will modulate the immune system and reduce histamine and inflammation, to support gut healing. Elderberry is an important one. If you’re worried about its immune-boosting properties and if it’s safe to use daily, I summarized all the research on that HERE. I would use this nightly, preferably in tincture form. 1 ml of tincture per day. Yes, this is less than many advise. A lot of protocols will say 3 – 5 ml of tincture, 3x a day. I have found that small doses help the body more gently and bring it into balance. High doses are often too much. Start slow, you can always do more. Finally, magnesium. Low magnesium levels have been tied to high calcium levels, high histamine levels, lowered immunity, anxiety, depression, and more. (source) Getting enough magnesium will also help to promote quality sleep, which is definitely necessary to feel better! I use it as a lotion, about 1/2 – 1 tsp. per day. More if I feel like I’m having trouble falling asleep. I will post specific brands and recommendations for all mentioned herbs and supplements at the end, so that it’s all in one place. Along with all of this, there are things you can do to improve how you feel and support detox. The goal is to make this easy for your body, if you possibly can. As mentioned above, there is a gut-liver connection. Plus, the liver helps to process all of the “junk” in the body and excrete it, so supporting the liver is very important. Key herbs include peppermint (as a tea or tincture), turmeric (already included in the golden milk, but tincture is good too), and milk thistle seed (as a powder/capsule — 1/4 tsp. powder or 2 capsules). The lymphatic system is comprised of a bunch of lymph nodes and clear fluid that surrounds the cells. It gathers wastes from the cells and takes them to the kidneys or liver for excretion. It doesn’t have a “pump,” like the circulatory system, so sometimes it needs help. Detox baths with baking soda or Epsom salts (1/2 cup of each per bath), light exercise (a brisk walk), and massage are all great ways to promote lymphatic detox. Dry skin brushing is beneficial too. Herbs like burdock root or calendula will help also! If you have access to sun…get outside! Enjoy fresh air. Get some exercise. The sun will help produce vitamin D and make you feel better too. Lowering your stress can help. Chronic stress is not good for your hormones or your gut! Saying “no” to things that are too much for you, venting to a friend, finding better work-life balance are all helpful. Many people talk about die-off. They may experience brain fog, fatigue, achiness, low fever, nausea, vomiting, diarrhea. Some people take this as a good sign — hey, the protocol is working! However, while mild symptoms may be good (tiredness, wanting to sleep more, a little soreness), more severe symptoms are not. These more severe symptoms indicate that your body is overloaded and not effectively eliminating the toxins. This means that you need to back off on what you’re doing, and support your liver more. Going slowly and effectively is better than pushing too hard and feeling worse. This does not play a role for everyone, but it can. If it’s something you’re worried about, there are a few extra herbs you can add to the protocol — slowly! Cloves are key. They are a gentle herb, yet very effective in dealing with yeast and many types of parasites. You can take small amounts of the powder mixed in food or in capsules. It is also effective as a tincture. Calendula will also help here (referenced above). Pumpkin seed oil is a great choice too, or actual pumpkin seeds. You can add the seeds to granola, or the oil to smoothies or salad dressings. Start slow! 1/2 tsp. oil or 1 tbsp. seeds may be plenty if you really are having issues. There are much stronger herbs, like black walnut and wormwood, but I would not start there. They are harsh and can cause side effects, and are not safe for pregnant/nursing women. (While the other herbs I mentioned are.) 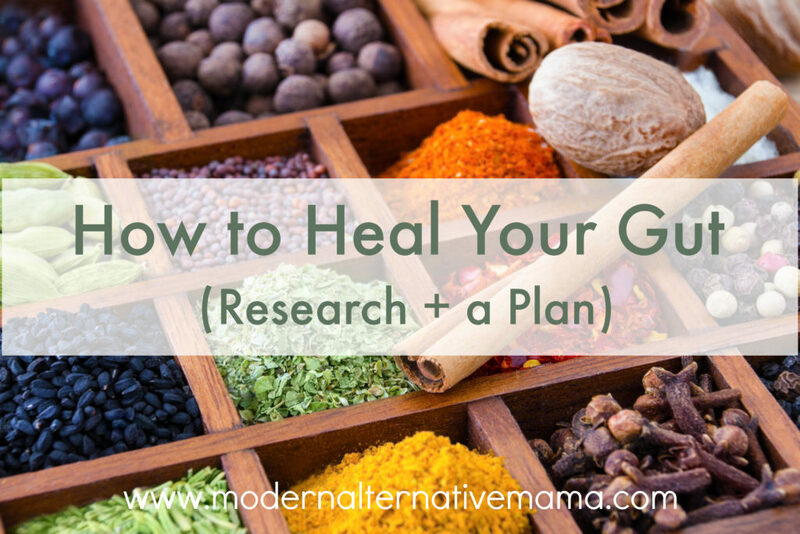 There’s no reason to start with the strongest herbs when gentler herbs often work just as well. How Will I Know I’m Better? And What Next? There’s no definitive answer and there’s no total “end” to it. We’re constantly being exposed to less-than-optimal things around us. Remember, this is a lifestyle shift. However, there will be a time when you don’t need to do all the supplements everyday and your diet can relax a little. You may be able to re-incorporate foods (real foods!) that you couldn’t tolerate before. When you are able to do the daily protocol, with the higher levels of herbs for at least a week without symptoms, slowly start introducing probiotic foods. Kombucha, water kefir, sauerkraut, etc. If you are still having histamine intolerance, wait at least a month after feeling better on the protocol before starting fermented foods. Once you are starting to truly feel “good,” slowly ease off the Oregon grape root, ginger/astragalus root tea, golden milk, liver support, and elderberry. You can still use these on occasion if you need a boost, but you don’t have to do them all daily. If you do want to continue, though, you can! It will probably take most people 3 – 6 months to see the level of healing they want (after getting on the full protocol). Some people may take 1 – 2 years if they’re dealing with more issues or tend to be the type to need extra support. At this point, you can also try reintroducing foods. Go slowly, and introduce only one and wait 3 – 4 days for a reaction. Sometimes, you may feel totally fine at first or for several hours, but then experience inflammation, brain fog, trouble sleeping, etc. the next day or so. Pay careful attention so you don’t undo progress. I hope this has been helpful for you! Feel free to ask if you have any questions. I cannot give out specific medical advice, but I can try to point you in the right direction to continue your research. Not sure where to start? No problem! These are my recommended brands to buy. Also, if you choose any Earthley products, use code GUTHEALTH101 to save 20%, through March 31. Shop the whole gut health collection HERE. If yo choose to buy bulk herbs, it would be around $30 for 2 – 3 months. The other supplements would be about $30 – $50 per month, depending on what you choose. I would recommend choosing bulk herbs if you can. Have you worked on gut health before? What about rotation? I find once I am on the same thing for a few weeks I develop sensitivities or allergies to it because of the bad gut health. I’m concerned about implementing same foods (morning smoothie for example) with all the same ingredients on a daily basis.